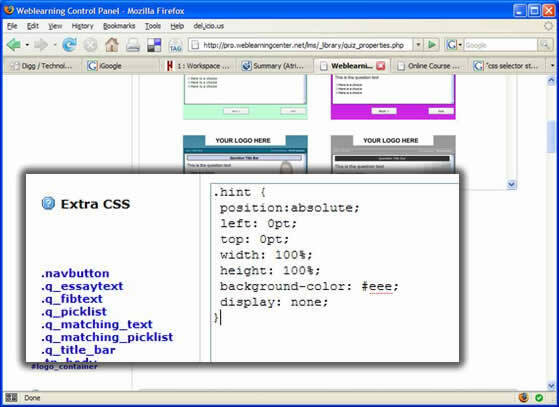 It got me thinking to how you can use Weblearning to do that without having to build additional html pages. It’s actually relatively simple to do, but perhaps just a tad technical for some. I still thought it was worth writing about, so here goes. Step 1: The fist step is to write your questions as you normally do. 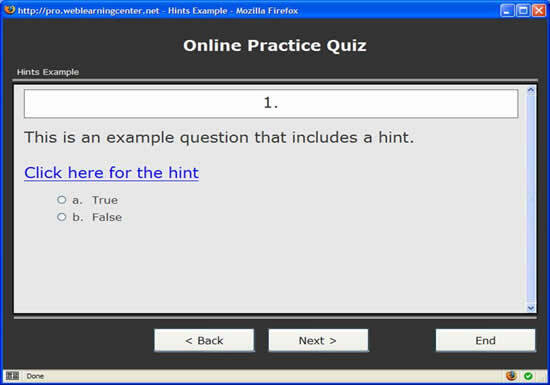 Step 2: Immediately below your quiz question text (or perhaps even inside of it somewhere), enter the phrase “Click Here for the Hint” (or something similar) – we will be turning that text into a link that shows the hint in a bit. 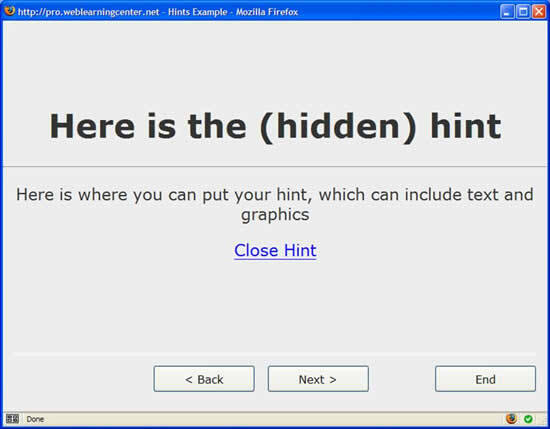 Step 3: Begin your hint text/graphic area – this will wind up being hidden in the quiz. Add (somewhere in your hint) the phrase “close hint” – this will be turned into a click-able link that will close the hint. Step 4: To turn your phrase “click here for the hint” into a clickable phrase that opens up the hint, click the HTML tab (along the bottom of the editor), and locate the phrase in the html source code. TIP: you can make the code window larger by dragging the bottom-right re-sizer. As you can see in the highlighted code, I have surrounded the phrase “click here for the hint” with some html code. This code can almost be a copy/paste scenario (you just copy/paste it into every question). The only thing you need to change is the ‘q1hint‘ part – each ‘hint’ is given a name (in this example, q1hint), and the link to SHOW and HIDE the hint both need to reference that particular reference (name) so the code knows which one to show/hide. Step 6: Much like we turned the SHOW HINT link to show the hint, we need to add code to the CLOSE HINT phrase as well. This code can also almost be a copy/paste scenario (you just copy/paste it into every question). Just as before, the only thing you need to change is the ‘q1hint‘ part – each ‘hint’ is given a name (in this example, q1hint), and the link to SHOW and HIDE the hint both need to reference that particular reference (name) so the code knows which one to show/hide. Step 7: Save your question, and publish a quiz with the question in it. You can also go ahead and add it to a course if you want (so you will be able to try it out). 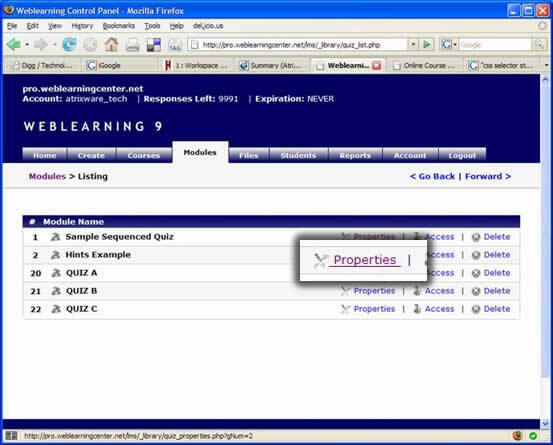 Step 8: Go to the Modules Tab, and click the PROPERTIES option. Now go ahead and test out the quiz. Admittedly, it is a bit technical, but once you have done one or two of these, it is extremely easy to apply to all of your questions. 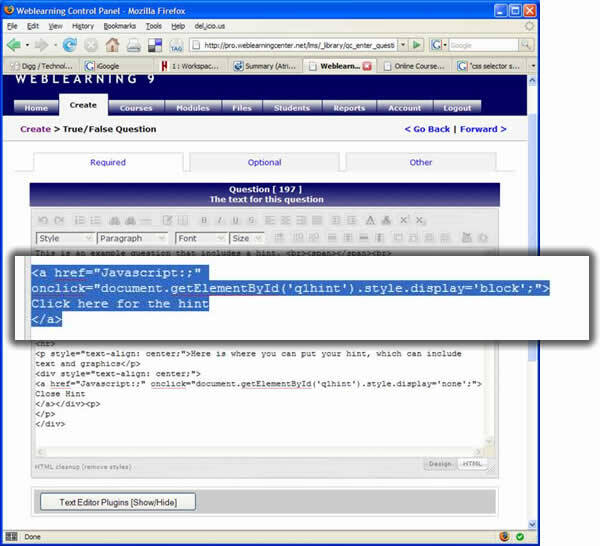 This entry was posted on Tuesday, February 26th, 2008 at 4:33 pm	and is filed under Anthony, Atrixware 101, Weblearning. Both comments and pings are currently closed.